Invited by Associate Director Bruce Chrisman, about 60 people gathered on Wednesday in the Kuhn Barn to enjoy a special luncheon. The group celebrated the successful implementation of the Oracle Project Accounting system. In April, the smooth transition to the new system affected all employees since Project Accounting required the replacement of budget codes with project and task numbers. In early October, the new system passed its final "test" as the Business Services Section produced all end-of-FY2003 reports for DOE on time and without significant problems. "The help desk has received very few phone calls," said Bob Willford, who manages training and administrative services for the Business Systems Department. "On time, on budget, no injuries" was the summary by Milorad Popovic, who managed the construction of two buildings for the new MuCool laboratory. "We used less than one percent of the contingency money." On Tuesday, project participants celebrated the completion of $1.5 million lab, which is located at the southeastern end of Fermilab's Linac. The construction was paid for by the international Muon collaboration. The MuCool laboratory will host infrastructure for accelerator R & D. Soon physicists will begin to test beam-cooling capabilities of absorbers and RF cavities that some day might be used to create compact muon beams. "By Christmas we will fill the first liquid-hydrogen absorber," said Steve Geer, spokesman of the Muon Collaboration. "In about a year we will receive a 201-MHz cavity built at LBL. By then we want to be ready to test it." "Intelligent Agent" computer programs are roaming the Internet and watching the skies. It may sound like science fiction, but these programs, using Grid computing technology, will help astronomers detect some of the most dramatic events in the universe, such as massive supernova explosions. Every particle has its own antiparticle in a well-established symmetrical pairing. In some cases, this pairing allows the transition of matter into antimatter and vice versa, through quantum virtual states (i.e. states which can exist only for a short period of time according to the Heisenberg uncertainty principle). This transition is technically referred to as "mixing". The study of this phenomenon allows physicists to infer the properties of the virtual states that enable the mixing itself. The results will either confirm or refute the predictions of the Standard Model. 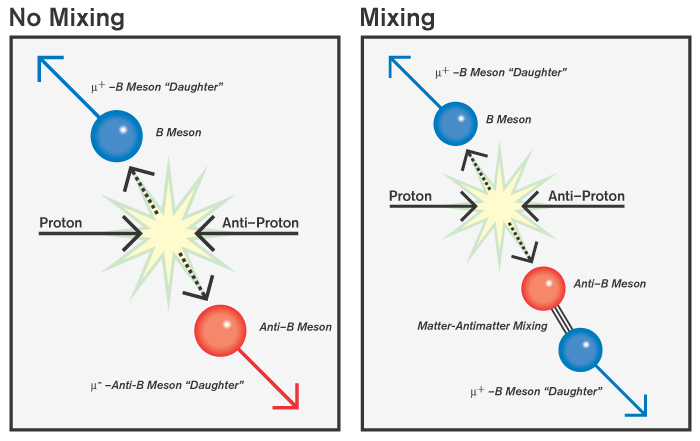 At CDF we've measured the probability of a B meson to turn into its antimatter partner, the anti-B meson. (Every B meson contains one b-antiquark and one d-quark. It exists for a tiny fraction of a second before decaying into other particles.) Produced by proton-antiproton collisions, the B mesons decay and leave signals inside the CDF detector. We infer the B-mixing probability by looking at the decay products of the B-mesons. We've found a mixing probability larger than the value observed in similar measurements performed with electron-positron collisions at the LEP collider (CERN). Although the CDF result could be tantalizing given its possible interpretation in terms of new physics, we are still cautious. The higher value we measure may be based on a yet-to-be-understood difference in the production environment (p pbar versus e+ e-). Fotis Ptohos (left, guest scientist at FNAL) and Giorgio Apollinari (FNAL) in front of a wedge of the CDF Hadron Calorimeter. The third main author, Paolo Giromini, is at present in Italy, waiting for his visa. It's time for our lab-wide party! Save the date: Friday, November 21, 3:30 to 6:30 p.m. in the atrium. Details will be announced in the next few weeks. DOE is holding a one-day conference on October 22 to commemorate the 50th anniversary of the "Atoms for Peace" speech by President Eisenhower. Fermilab is contributing posters to the conference exhibit. From October 17 through January 19, the Einstein Exhibit will be on display at The Field Musuem. The exhibit explores the legacy of Einstein as a scientist who changed our concept of space and time. Some of his handwritten documents, including those containing the theory of relativity will be on display.